Clean energy sources such as wind and solar power are being used more and more frequently over traditional options like coal. Since 2008, the energy generated via solar power in the United States has grown more than seventeen-fold, enough to power the equivalent of 5.7 million average American homes, according to the Office of Energy Efficiency & Renewable Energy. Trouble is, these existing solar arrays are still pretty inefficient at collecting solar energy, with a theoretical efficiency limit of about 33 percent. This inefficiency could soon be improved thanks to new self-assembling nanomaterials developed by researchers at the Advanced Science Research Center (ASRC) at The Graduate Center of The City University of New York (CUNY). In a paper published earlier this month in the journal Physical Chemistry researchers from ASRC at CUNY describe newly developed nanomaterials which use a process called singlet fission to extend the life of harvestable light-generated electrons. Although it was first observed in 1965, the exact process of singlet fission is still a debated topic unique to molecular physics. Essentially, the process allows for more time to the excited electrons created by light absorption. 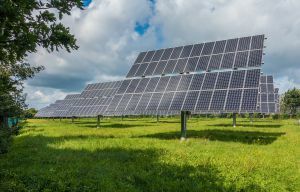 The team’s research suggests these materials could create more usable charges and increase the theoretical efficiency of solar cells up to 44 percent. By combining different versions of the commonly used industrial dyes diketopyrrolopyrrole (DPP) and rylene the team created materials with self-assembling properties. Each combination had slightly different factors that determined how well the combination was able to harvest energy. Now that they’ve developed a way to increase the energy produced from harvested solar light, the next step is in figuring out how to capture all of the energy generated in the process. Even though such a process may take time, the initial results open a variety of new avenues for experimentation.